TAMPA — Just four teams remain in the hunt for a Warm Up title — Brown, Georgia, Central Florida, and Texas. And, no, that’s not a typo — the same Central Florida team that missed Regionals one year ago after losing to South Florida in the game-to-go has been on a tear this weekend. Saturday’s match play continued to offer some wild upsets as teams jockeyed for position in the algorithm-based rankings that would determine the bracket positioning. 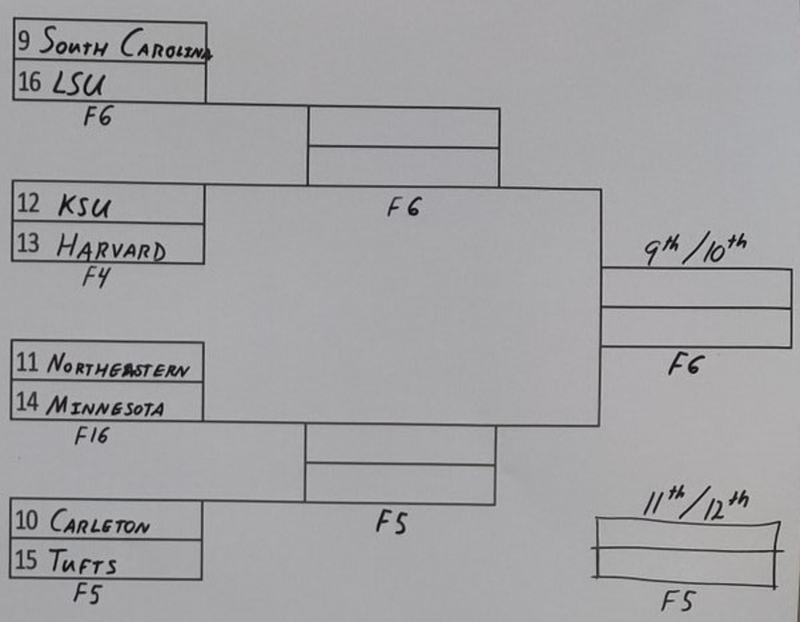 South Carolina was the lone team with one loss or fewer to miss the championship bracket. Here’s a look at the action from Saturday. 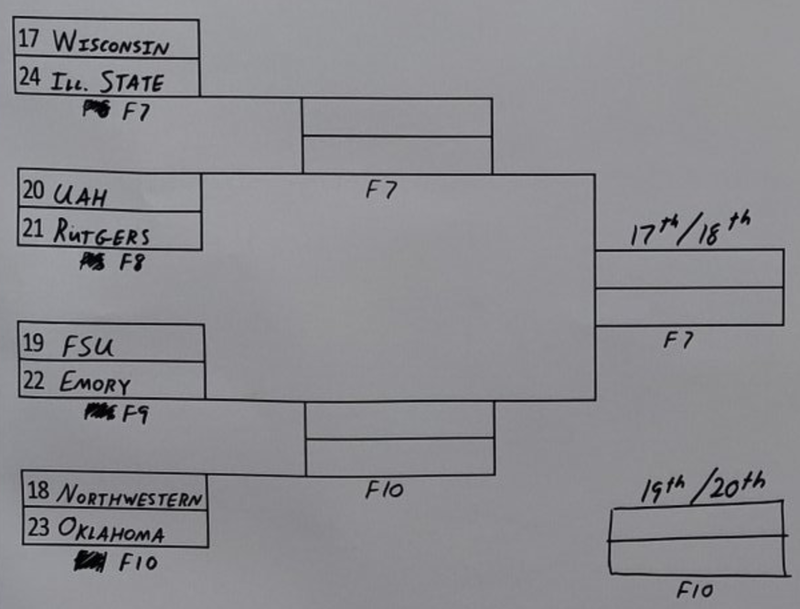 BYU didn’t get a chance to play in the bracket at the end of Saturday, but they more than made up for that with their final four rounds of match play. A dramatic second half comeback win over Pitt culminated in a break to win on double game point, and BYU confirmed their status as one of the top teams in the country by looking every bit as talented and sound as one of the most talented and sound teams in the country in Pitt. The win was preceded by a comfortable win against Northwestern and followed with dominant wins over Cincinnati and a seemingly uninterested Carleton. After the first two days of the tournament, BYU has a strong case for being the best team here. Brown will get one more day of action as their closing argument for the most impressive team at Warm Up 2019, but BYU’s success in Tampa will absolutely go down as one of the biggest takeaways from the weekend. And this comes after they went undefeated at the Santa Barbara Invite. Jordan Kerr was a nightmare for opposing defenses, one of the players of the tournament, and he led the team in assists with 33 over eight games. Joe Merrill led the team in goals and Braden Eberhard quarterbacked the offense at an elite level while the team’s horde of big, athletic cutters provided matchup issues for every team they played. BYU is more than just a team that could make Nationals; they would be a legitimate semifinals contender. And they proved that on Saturday. Carleton’s Saturday was an unmitigated disaster. They were run off the field by Central Florida in the second half of of their matchup, getting outscored 6-2 and never looking like they had a chance of winning. UCF ran laps around Carleton in terms of physicality and energy and were deserving of the lopsided 13-8 scoreline. Carleton’s struggles continued in the next round against BYU. They were broken twice to start, and four times in their first six offensive points. The teams traded holds for the majority of the rest of the game to 12-7, before Carleton got a couple garbage time breaks to create a more flattering 13-10 final scoreline. CUT’s energy and effort levels were low, and their backfield really struggled to find any sort of rhythm or success. Chris Padilla, tasked with the majority of the team’s O-line backfield touches, had a rough day, and the entire Carleton handler core looked outclassed by both of their marquee opponents on Saturday. They then ended their day with a 15-13 loss to Tufts in consolation play. Seasons aren’t made or broken on Saturdays in February, as CUT well knows — they missed the bracket at Warm Up in 2017, too, before winning a National Championship. But Saturday was a stunning and, frankly, embarrassing day of results for a team that should have been in contention to win this tournament based on the depth of talent on their roster. There’s not much to say here. Michigan beat Cornell 13-0. Michigan was just a machine in the game and Cornell couldn’t patrol the deep space effectively. We filmed it. You should watch it: it’s thrilling to see if a team can pull it off, like shooting the moon in hearts. Central Florida let a game-long lead slip away late but closed out a 12-11 win on double game point over UT-Dallas in the quarterfinals. UCF opened the game with a break after great handler defense from Tyler Carolino set him up for multiple layout blocks on the point. They completed the upwind-downwind break pair three points later to go up 3-1. Adam Vinson was an offensive force on both the O- and D-lines, piling up goals and helping to finish off points. The teams each held into halftime, where UCF led 8-6. UTD claimed their first break of the game to start the second half when Logan Harless got loose deep in transition, but they couldn’t complete the break with the downwinder and UCF held and then broke downwind to go up by three. UTD’s Victor Mao and Wesley Miaw started to assert themselves more late in the game and led Woof to a 3-0 run to tie the game at 11 and force double game point. After a timeout, UCF dialed up a play for their big man, 6’8″ Adam Lapikas, who went deep against triple coverage and hauled in the game winner. 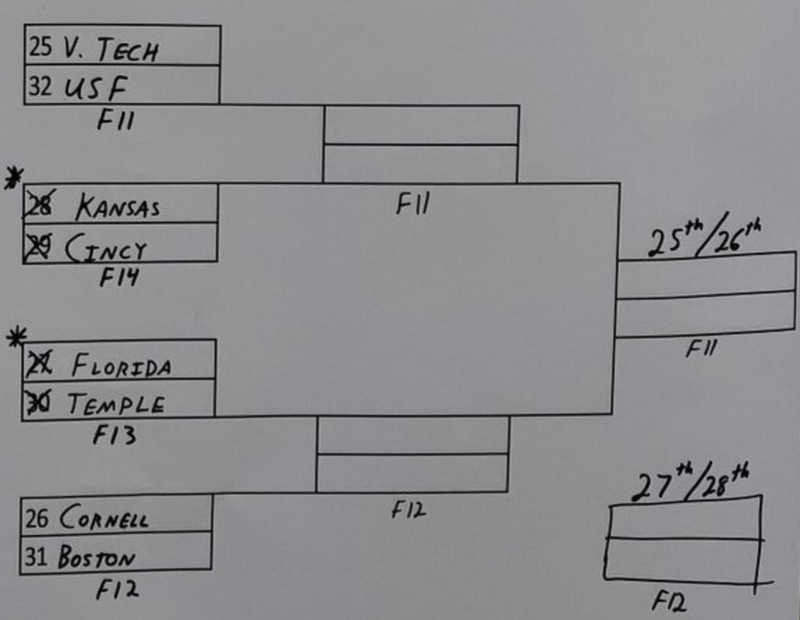 Pitt entered the bracket as a heavy favorite to make the final. They’d looked like one of the two best teams of the tournament on Friday, and their one loss on Saturday — a double game point defeat to BYU — looked like little more than a tight loss against a fellow elite team that could easily have gone their way1. Texas, on the other hand, was blown out by Central Florida on Friday and had a couple close wins over teams that finished nowhere near the top bracket in LSU and Tufts Saturday morning. Georgia won a sloppy contest 13-8 over Michigan, as neither offense looked especially sharp. Michigan, in particular, was beset by execution errors: endzone drops on uncontested hucks and badly missed throws to open cutters prevented them from ever finding their footing in the game. Georgia didn’t play a perfect game offensively, by any means, but they avoided the disastrous, morale-sapping errors that plagued Michigan. Georgia started the game with a break after a big layout block from Brandon Li on an under set up a short field for their D-line offense. They got breaks on two of their next three defensive points, too, to open up a 4-1 lead. The opening salvo appeared to stun Michigan, who entered the game undefeated and had barely played in a close game to that point. Georgia took a 7-3 lead without playing especially well and then slogged their way through the second half. Michigan got a few more holds, as they cleaned up the offense a bit, and Georgia was less efficient with their break chances, but they could never get within striking distance of a true comeback. Brown, the #1 seed in the bracket after their 6-0 run in match play, took a small first half lead and ballooned it into a six point win, 15-9, over Texas A&M in the quarterfinals. A switch to a zone defensive look gummed up A&M’s offense and Brown went on a 4-0 run in the middle of the second half to seal it. Sophomore Dylan Villeneuve has been excellent all weekend as a defender and the key driver of the D-line offense. It’s striking how different the defense looks with him on the field after the team played without him at CCC in the fall. Brown’s record is spotless so far, but they have yet to play one of the top tier teams at the tournament. 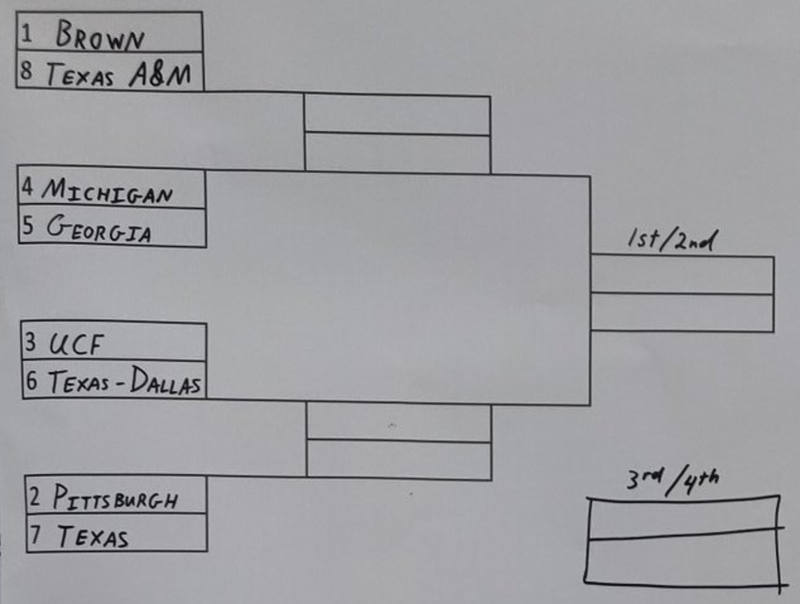 Before playing A&M, Brown had only played two of the eight championship bracket teams — UT-Dallas and Georgia. Their semis game against Georgia is a rematch of a 13-9 win in match play. 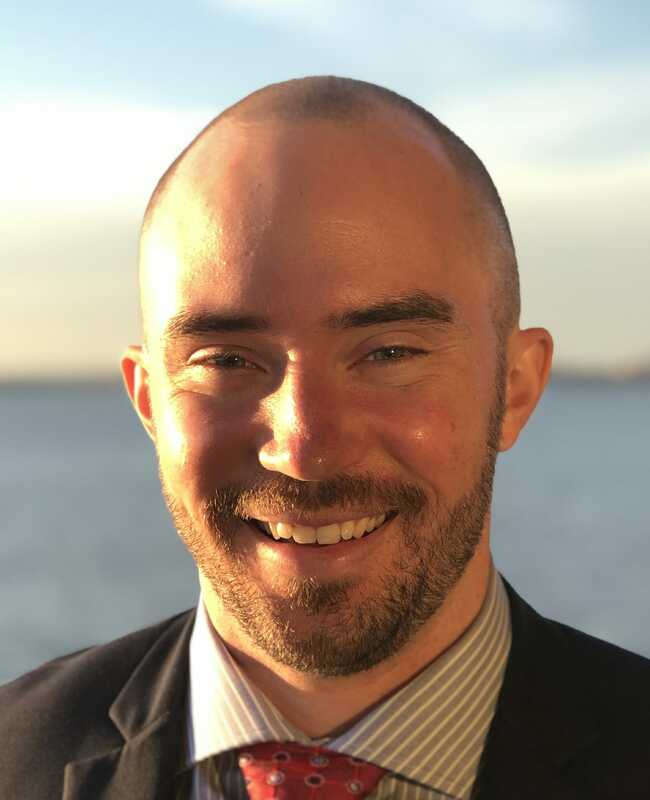 Comments on "Florida Warm Up 2019: Saturday Recap"